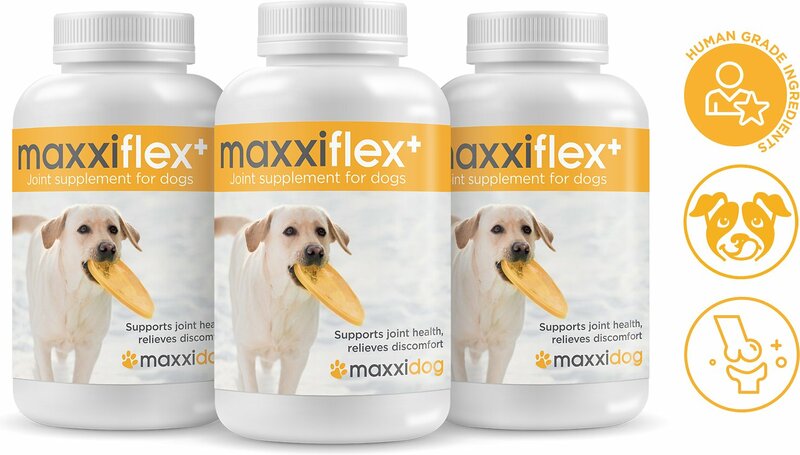 Keep your pup comfortable and active for years to come with the powerful support of maxxidog maxxiflex+ Dog Joint Supplement. 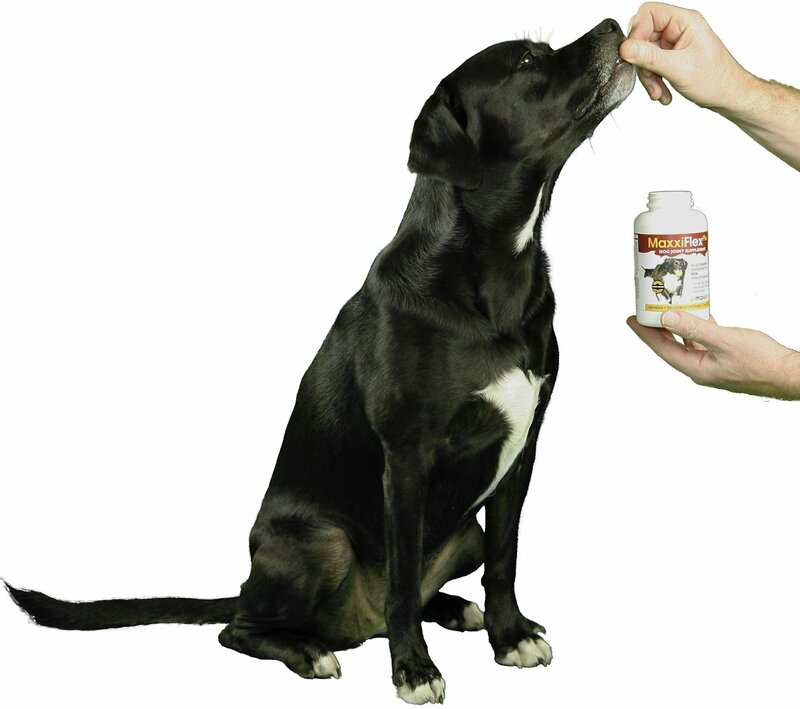 Made in the USA with premium ingredients and lab-tested for purity and potency, this safe and effective joint health supplement will put the bounce back in your pooch’s step, no matter what size or age he happens to be. 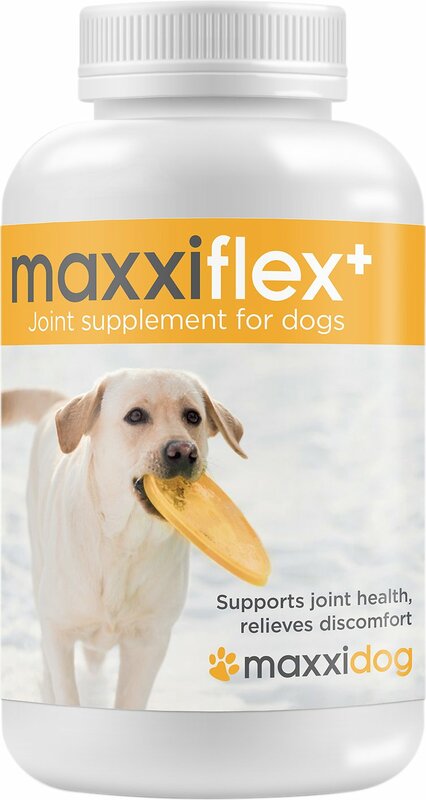 It contains 15 specifically selected ingredients to support healthy joints in your canine companion, including chondroitin, MSM and hyaluronic acid to protect and lubricate cartilage and connective tissue. And the use of glucosamine, devil’s claw, bromelain and turmeric for the natural reduction of swelling and pain means your furry best friend can keep up with the frolicking fun that he loves. Contains a unique blend of antioxidants, glucosamine and chondroitin, and MSM and hyaluronic acid for maximum results. Delectable liver-flavored chewable tablet is easy to administer, thanks to a savory taste and texture that dogs love. Perfect way to easily support excellent joint health and promote better mobility in dogs from tiny to titan breeds. Supports cartilage function and regeneration, reduces swelling and pain in the joints, and maintains tissue health. Active Ingredients: Glucosamine HCL (Shellfish Source), 720 Mg, Chondroitin Sulfate (Bovine Source), 250 Mg, Hydrolyzed Collagen 250 Mg, Methylsulfonylmethane (MSM) 200 Mg, Fructooligosaccharides 170 Mg, Bio Active Whey 150 Mg, Devils Claw Extract 100 Mg, Phellodendron Tree Extract 50 Mg, Cetylated Fatty Acids|50 Mg, DL Phenylalanine 50 Mg, Bromelain 25 Mg, Calcium Ascorbate 20 Mg, Sodium Hyaluronate (Hyaluronic Acid) 20 Mg, Super Oxide Dismutase 10 Mg, Turmeric Extract 10 Mg.
Inactive Ingredients: Di-Calcium Phosphate, Isomalt, Liver Powder (porcine source), Magnesium Stearate, Natural & Artificial Flavor, Stevia. If giving more than 1 tablet daily, divide between AM and PM. Double the daily amount for first 3 weeks. So far, I am very Impressed by this product. One of my German Shepherd’s has elbow dysplasia in both of her front legs and she frequently limps in the morning and while it’s cold outside. Even though she will be getting surgery for this condition, I put her on this glucosamine to give her some relief in the meantime into ensure the longevity all of the other joints in her precious body. I am amazed that after one week of being on this, she has not had any lameness in her front legs at all. I will be giving these tablets to both of my GSDs for the rest of their lives and they are almost 2 years old now. This has been great for my seniors! Saw improvement in my old dogs within weeks. My tiny Guppy would limp after resting due to his stiff joints, now I don't see him limp at all. Zimbie had quit jumping up on me for snacks, now he is back to standing on his hind legs for his treats. The best supplement I have found. 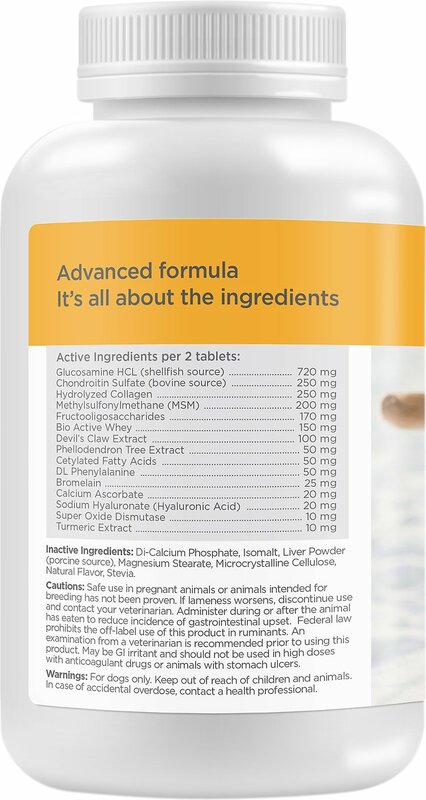 I had been giving my 9 year old Labradoodle this supplement daily and really seemed to make a difference. Then I couldn't find it and I noticed she was starting to really limp again and her hips really bothered her. I had been ordering her dog food on Chewy.com and looked for this supplement and was really excited they had it in stock. One week taking it again and it is an amazing difference in her walk. My big old boy has been on Maxxiflex dog joint supplement for couple of months now and he is doing really great. I can see he feels better and he enjoys going out again. We are both very happy with this outstanding product. I have been buying this Joint Supplement for over 2 years for my German Shepard Odin who is now almost 6 years old. I did switch over to a different brand 6 months ago, sorry I did, as I started to notice recently that he is having more difficult time jumping in to our Chewy Suburban, now he already seems be more flexible plus he likes the taste I use it as a treat, he tends to be pretty picky used to to spit the other brand out. I believe my Aussie is able to get on her hind legs a lot easier using MaxxiFlex. She been on it not guite two weeks. And see that improvement already.